We said said we want to generalise the set of complex numbers, but we derived only the minimum set of numbers necessary for our generating function, namely multidimensional numbers with integer coordinates. So our M4 set are only the Gaussian numbers. In order to represent complex numbers we need fractions and real numbers. We can easily extend our scheme to define these and other useful sets. Even though not necessary for our purposes, I think it is interesting. I’ll outline how to do that in a way that is hopefully easy to follow, but not very rigorous. For this post to make sense you must have read and understood the maths section. Let us consider any two consecutive numbers on any chain. Let us say, for simplicity that the blue arrow corresponds to the open function +1, although of course the same applies to any other chain. First we introduce an intermediate number. The green arrow would then correspond to the chain +1/2. It is defined by d22(x)=inc(x). In this case the brown arrow corresponds to +1/3, which is the chain defined by d33(x)=inc(x). The red arrow corresponds to +1/4; it is defined by the chaind44(x)=inc(x). Since d44(x)= d42(d42(x)), it holds that d42(x)=d2(x). Continuing this way we can make fractions with arbitrary denominators, but this is unsatisfactory because as we increase the number of intermediates we lose the ability to express some numbers we could do previously. For example, in the diagram above with two intermediates we can express the number 1/3. Increasing the resolution to three intermediates loses this ability again. Instead we now add intermediate chains and keep the previous ones. For the next step with three intermediates you might expect three new numbers, but you only get two, because we have one of them already; two applications of the +1/4 chain is equivalent to one of the +1/2. This diagram shows the fractions ¼, 1/3, ½, 2/3, and ¾, but we can combine the chains to express other fractions. With a finite depth of nested intermediates we have generated the set Qn of fractions, where Qnis the set generated by repeated application of chain d to 0 and where dnn(x)=inc(x). If we allow infinite applications of functions then we can generate new sets: hierarchies of infinities and infinitesimals as well as real numbers. Any number that can be reached by a finite number of applications of an inc function to zero is finite. Conversely, numbers for which this is not true, we call “infinite”. “Finite” and “Infinite” are properties of the numbers, like “even” or “odd”. This defines the positive integers n as a finite applications of f. Remember that we use the shorthand notation f3(p) for f(f(f(p))). We pick any infinite n and call it ∞. All the usual chain and loop axioms apply to infinite numbers. “Infinite” is a property of a number. The number ∞ – 1 is less than ∞, but still infinite. The number ∞ + 5 is a number 5 applications of the inc function away from infinity the same way that 1000 + 5 = 1005. This is contrary to the usual treatment of infinity that treats a set of infinite numbers as a number and takes ∞ + 5 = ∞. In Hilbert’s Hotel an infinite number of rooms are all occupied. A new guest can be accommodated by moving all guests up one room. An infinite number of new guests can also be accommodated by moving all the guests from room n to room 2n, freeing all the odd numbered rooms. This only works when you confuse the property “infinite” with the number “infinity”. Hilbert’s hotel is as much a paradox as saying that my two-seater sports car has an even number of seats ergo it can accommodate 4 people. If the hotel has ∞ number rooms and a new guest arrives then we have ∞ + 1 guests. If an infinite number of guests arrive then we end up with 2∞ guests. We can’t just conjure up new rooms and all the usual rules of arithmetic still apply. We can express any fraction with a finite depth of intermediate numbers. Transcendental numbers, such as π or√2, cannot be expressed as a finite fraction. We can approximate them to an arbitrary accuracy using fractions with bigger and bigger denominators, meaning more and more intermediate numbers, but to express a transcendental number accurately we need an infinite number of intermediates. The blue arrow depicts an inc function again. The grey arrow is the function d∞(x) , where Δ = d∞(0) is an infinitesimally small number, such that it takes infinity applications of the grey functions to advance the distance of a blue function. This way we can use our chain functions to also generate the real numbers. Consider the structure of the functions +1 and +1/2. The +1 chain function is shown in blue and the +1/2 chain function is shown in green. The +2 function is shown in orange. You will notice that these two structures are isomorphic, i.e. there is a one-to-one mapping between them. In other words the blue function is to the green function like the orange function is to the blue function. Looking at the grey d function (adding an infinitesimally small value to a number), we see an automorphism similar to the one shown in the previous section. The grey function is isomorphic to the blue function. If we consider the grey function to be +1 then the numbers on the blue function chain will be a series of infinities. These have been studied by Cantor. If we look upon the chain function d∞(x) as inc(x) then the numbers 1,2,3,… become ∞, 2∞, 3∞, … After an infinite number of infinities at ∞∞ we arrive at a number that Cantor says has the cardinality of aleph1. We can keep going scaling up infinities. There is never a final biggest number that cannot be exceeded. We can of course apply this mapping the other way and consider the blue function to be in which case the numbers generated by the grey function might be related to surreal and hyperreal numbers. Maybe a mathematician reading this could confirm or refute? We can apply infinitesimals and infinities to loop functions, too. I don’t know whether these sets have already been explored. A loop function with an infinite order is not the same as a chain function. 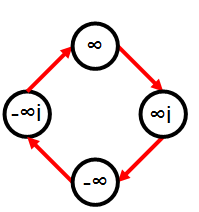 A loop function returns to the first value after infinite applications, while chain functions continue to make new elements even after infinite applications or more. This entry was posted in Mathematics on 05/08/2013 by xentwtww.